1. 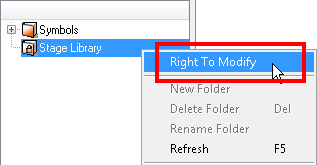 In the Library view,right-click on the library folder containing the template to modify and select Right To Modify. 2. In the Library view's right side,right-click on the extra drawings template to modify and select Edit Template. A new Animate Pro application opens. 3. In the Tools toolbar, select the desired drawing tool. 4. In the Colour view, select the desired colour. 5. In the template's timeline, select the blank cell where you want to draw your new piece. 6. In the Camera or Drawing view, draw the new pieces. 7. If you are using drawing pivots, in the Tools toolbar, select the Drawing Pivot tool and in the Camera view, set the pivot directly on the new drawing's cell. If you are using sybmols and symbol pivots, in this case, you do not set the pivot on the symbol's cell. 8. In the top menu, select File > Save or press [Ctrl] + [S] (Windows) or [⌘] + [S] (Mac OS X). 9. In the top menu, select File > Quit (Windows) or Animate Pro > Quit Toon Boom Stage (Mac OS X).